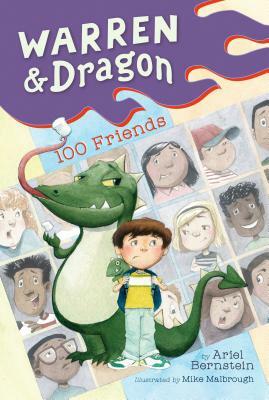 With Calvin and Hobbes appeal, a boy and his "pet" dragon take on a new school and attempt to make 100 friends! Warren is a seven-year-old boy. Dragon is a 122-year-old dragon. Not that most people believe that. Most people are sure that Dragon is a stuffed animal. People such as Warren's twin sister, Ellie, who challenges Warren to a contest at their new school: making 100 new friends. Warren isn't so good at making friends, but he doesn't like losing to Ellie, and Dragon will help him. But the first day of school doesn't exactly turn out the way he'd hoped, and even worse, Dragon disappears! By the time Warren gets home, he's not only not made any friends, he's lost his best friend. Ariel grew up outside of Philadelphia (developing a cheesesteak obsession), went to college at Barnard in New York (developing a sushi obsession), and now lives in the suburbs of New Jersey with her family (developing a marshmallow obsession). She doesn't have a pet dragon, but does have the occasional herd of deer show up in the backyard. Besides writing children's books, Ariel's worked in a movie theatre, at a Baskin Robbins, as a camp counselor, a paralegal, in human resources, and as a stay-at-home mom.